Simon Jackson, who shot to fame as the founder of the Spirit Bear Youth Coalition when he was just 13 years old — is a storyteller, connector and movement builder committed to improving our public discourse and shaping a better balance between the needs of people and nature. Discussing his personal story, as well as the intricacies of founding a non-profit and navigating both business and politics, Simon inspires audiences to realize the “power of one” to encourage change and challenges citizens to re-think how we tackle complex environmental challenges. Simon led the campaign to save the spirit bear for two decades, helping create the largest land protection measure in North American history. 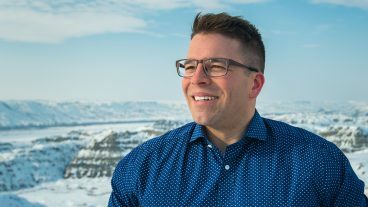 For his efforts, he was named a Hero for the Planet by Time Magazine and was the inspiration for the movie, Spirit Bear: The Simon Jackson Story. Today, Simon leverages his skills and experiences as a strategist to help diverse clients secure a social license to advance good ideas that will benefit all of society. Additionally, Simon is a widely published author, as well as the lead storyteller for GhostBearPhotography.com, a photo and essay-driven, nature-focused education platform Simon co-founded in 2013. The discourse surrounding the environment has become increasingly polarized and simplistic. How do we mobilize a populous that is overwhelmed, misinformed and apathetic? We must heal the wounds that divide by championing personal stewardship and innovative ideas that work with the human condition. The world needs a generation of environmentally literate citizens – a cohort that understands and appreciates the value of nature. By deconstructing the complex and enlivening the obscure, we have the tools to create a nation that thinks critically about how to balance the needs of people and the environment. We just need the desire. Fifty plus one is a loss. With too many issues facing our world, we need to stop re-fighting battles that have already been won. How? Politically sustainable solutions. By shifting the emphasis from rushed compromise to asymmetrical balance, we have the ability to move past watered-down bottom lines and toward innovative ideas that can bridge divides and generate lasting support. Debating complex issues in a 280-character discourse is almost as hard as cutting through the noise to inspire action. Yet positive communication within a purpose-focused movement was the recipe that not only save the spirit bear, but also what underpinned the creation of the largest youth-led environmental movement in the world. Millennials are more aware of the world’s ills than any generation before them, thanks to the Internet, but it’s both a blessing and a curse. The ease with which we can captivate and unite young minds is easier – and cheaper – than ever before. But so too is the ability to reinforce tired views that individuals don’t matter. Yet when a narrative can be authentically authored to prove, categorically, that one voice can make a difference, rising leaders have proven they will be present, accountable and engaged. Education is the most important and cost-effective means of creating stronger communities and a better world, yet the system is failing our future minds far too often. It’s a challenge that shouldn’t fall at the feet of teachers – or even governments – but a burden that must be shared by every citizen. In telling stories of success and failure we can map a better path forward and embrace the teacher in all of us. Building non-traditional allies across partisan lines. Aligning good ideas with powerful motivators. Creating ready-made, plug-and-play solutions. These are the political lessons from one of Canada’s most successful movements and by dissecting the good, bad and ugly of the spirit bear campaign, it’s a road map for political impact. No journey is easy and all dances with depression can cast long shadows on even the happiest of endings. But it’s in the honest disclosure of even the most uncomfortable experiences – the hardest truths – that allow for learning and growth, acceptance and help, compassion and hope. After all, it’s in the understanding that most everyone has a story of resiliency and that each offers a new path toward a better tomorrow. The issues we grapple with are rarely black-and-white and the understanding that there are very few true ‘enemies’ is a message we need to hear more. Yet we also must realize that having empathy for those we disagree with is only possible if we’re open to having honest, hard conversations. A grizzly bear that defied science with its love to play. An otter that refused to let her paraplegic pup die. Two fox vixens that worked together to raise kits after both their mates were killed. These are some of the incredible stories of Canada’s nature and powerful images bring ten years of adventure in Canada’s iconic landscape to life. Your sessions on The Power of One touched a chord with many of our teachers and were significant to the program’s success. Simon was a hit. People were impressed by his message about the “Power of One” and his insights as to how to involve youth at college in successful social action.